As I mentioned, this past week was my son's birthday. I really like to make birthday cakes. Even though they are far from perfect, I think they are extra special, super fun, and taste Divine. My son is big into motor sports so this year he requested a dirt-bike cake. This is what I can up with. Pretty cute don't ya think? I used two devil's food cake mixes and made one sheet cake and an extra one in a 8 x 8 pan. I used the small cake to make the two hills. I frosted everything in my Mom's yummy chocolate frosting. The grass is shredded coconut died with green food coloring and I made the track more dirt like by sprinkling it with crushed cookies. My son loved the cake but especially loved the new dirt bike toy he got from the top! In a sauce pan melt the butter, milk, and cocoa till bubbly. Remove from heat. Beat in powder sugar till desired consistency is reached. (about 1/2 bag) When almost done, beat in vanilla. EDIT: Mom caught a typo! I had listed 1/2 cup milk but the recipe actually calls for 1/3 cup. So sorry! Sometimes when I make something that I'm really proud of I just love myself. But actually I love Kate over at Centsational Girl. Seriously, this girl is amazing! Her blog was the first "design" blog I started following and was the inspiration for starting this little blog. I hope to one day be half as cool as her! 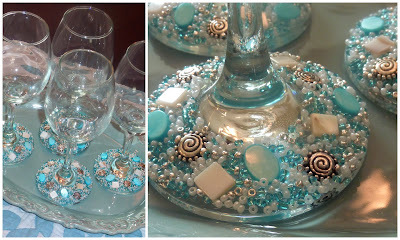 Anyway, the other day Kate made the most amazing jeweled stemware. She found the inspiration at a local winery. 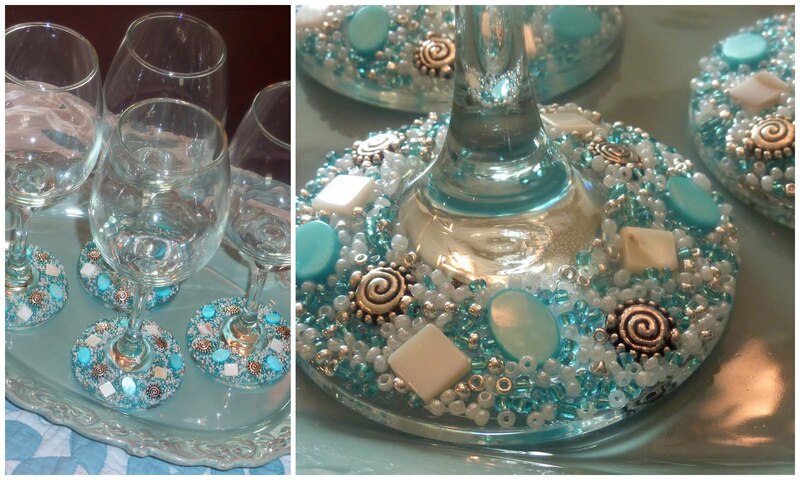 They were $75 a glass and she recreated them for about $40 for a set of four. Amazing! So I decided to try my hand and make a few myself. Wanna see them? Didn't they turn out great! I just love them! I got the glasses at TJ Maxx for 5.99 for the set and spent about $15 on beads (with a ton left over) and $5 for the silicone. So I made my set of four for only $26. I'm going to make four more since I have plenty of beads and silicone left and I might even try my hand on some hurricane glass. You can see Kate's full tutorial HERE. EDIT: The question has been asked, "How do you wash them?" Because they are glued on with silicone (same stuff used for aquariums) they are completely waterproof. Still, I would recommend hand washing and be gentle around the beads. Since I only use fancy glasses like this on special occasions anyway, hand washing is just fine with me. Every year I make my kids a special t-shirt for their birthday. Since my son's birthday was yesterday (Happy Birthday Ezra!) I thought I'd show you what I came up with this year. Remember the shirts I made for my kids HERE? Well I used that same technique. I cut out a stencil with freezer paper and used bleach to change the color. Unfortunately the words were kinda small and the shirt took FOREVER to change. So by the time I got the stencil off, the bleach had spread and the words were hard to read. So I decided to outline it with embroidery floss. I also accented it with a few extra squirts of bleach. Overall I think the combined look is pretty cute! And the best part, the little man loved it! 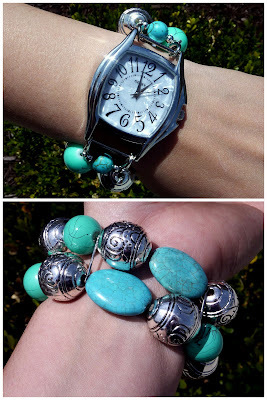 I cannot tell you how many blog giveaways I have entered but never win. But still I enter, thinking "you really won't win if you don't enter." So when Tatertots and Jello announced the winner of a giveaway and I saw MY name, I almost fell over! (Good thing I was already sitting.) Wanna see what I won? Isn't it SO cute! I want to give a big THANK YOU to Aimee with Palm Trees and Chocolate. I LOVE it! If anyone wants some wrist candy like mine, be sure to check out her website. She has some seriously cute things! For today's scrumptious Sunday I'm going to share one of my absolute favorite recipes. If we are ever going to a BBQ or potluck, this is what I bring. It is SO good! Mix all ingredients together and salt to taste. 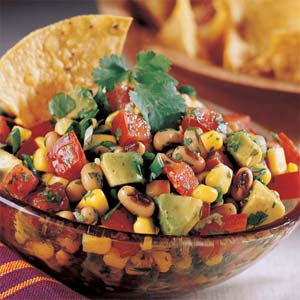 Serve with tortilla chips and try not to eat the entire bowl! I lost the rate your space contest. (sob, sob) No not really, I am super pleased to have made it into the top 3 and it was fun showing it off and reading all the sweet comments. 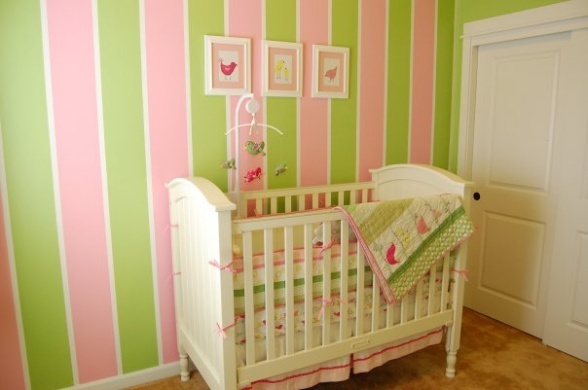 Here is the room that beat me out. Isn't it super cute?!?! I love how bright and happy it feels. She did a great job! Thanks to everyone who voted for me, I appreciate your support. Love ya all! If you want to see my first attempt at these blocks, you can see them HERE. Step 1: Get wooden blocks. I was shockingly surprised at how expensive blocks were at the craft store. So I went to Lowes were I found 3x3 posts. I (with the help of my hubby) was able to cut 13 blocks out of one post. I than sanded the cut edges "somewhat" smooth. Step 2: Paint your blocks. I used acrylic craft paint and did a couple coats. You can use any color to match your decor. My one suggestion would be to keep them neutral enough that you can mix them with your other holiday decorations. Step 3: Sand your blocks. I wanted a distressed look so I lightly sanded the surface and really went at it at on the edges. I actually used a palm sanded and it made my life a lot easier. Step 4: Stain. I used a basic wood stain (minwax early american) slathered it on and then wiped away any excess. This will stain any areas that you exposed the bare wood and give a antiquing to your paint finish. Step 5: Cut your letters. 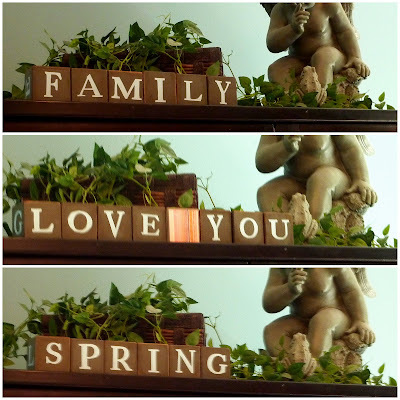 Using scrapbook paper cut out paper letters. For those who are lucky enough to own a cricut cutter, this will be an easy task. For the rest of us it is a little less simple. I wrote the letters up in a photo editing program in a font I liked. I than mirrored the image so that after I printed and cut the letters out, the "right" side wouldn't have any computer ink. My program also allowed me to outline the letters so I didn't have a huge inky mess. I than cut them out with scissors, using an exacto knife in tight spaces. Step 6: Apply the letters. I used modge podge to apply the letters to my blocks. I carefully made sure that all the letters were firmly down. Step 7: Seal. Using a spray acrylic finish, spray all sides of your blocks. I chose a matte finish but a gloss would look nice too. OPTION: Since I had extra blocks I decided to make 3 additional "decorative" blocks. 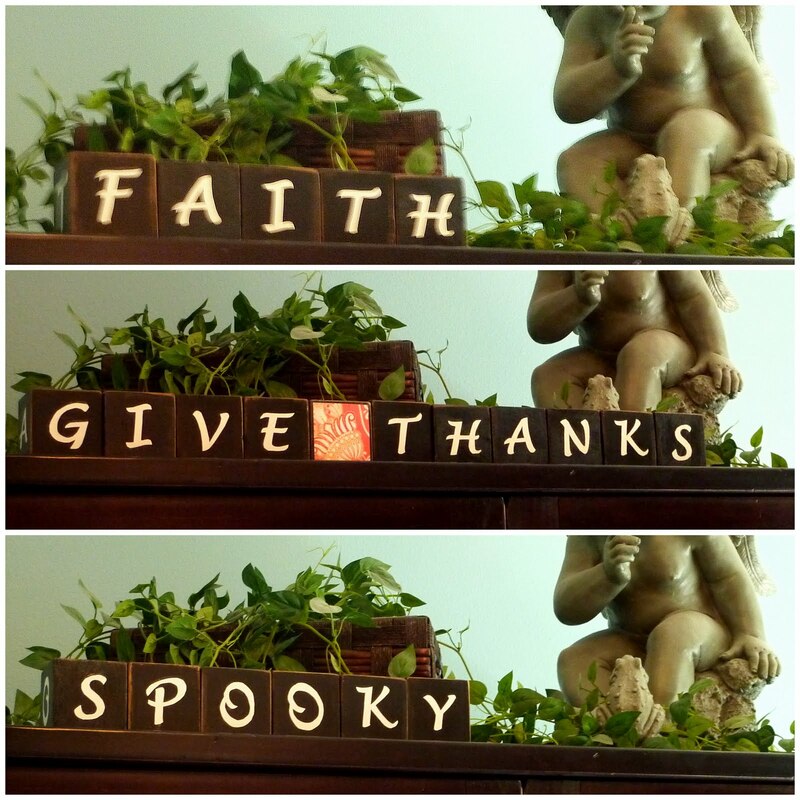 I finished them the same as above just instead of putting on letters, I put on squares of seasonal scrap paper. (Christmas, Easter, 4th of July, Thanksgiving, Fall, Summer...etc) They are fun to mix in with the other blocks or use as spacers between words. Here is a small sampling of some of my decorative options. 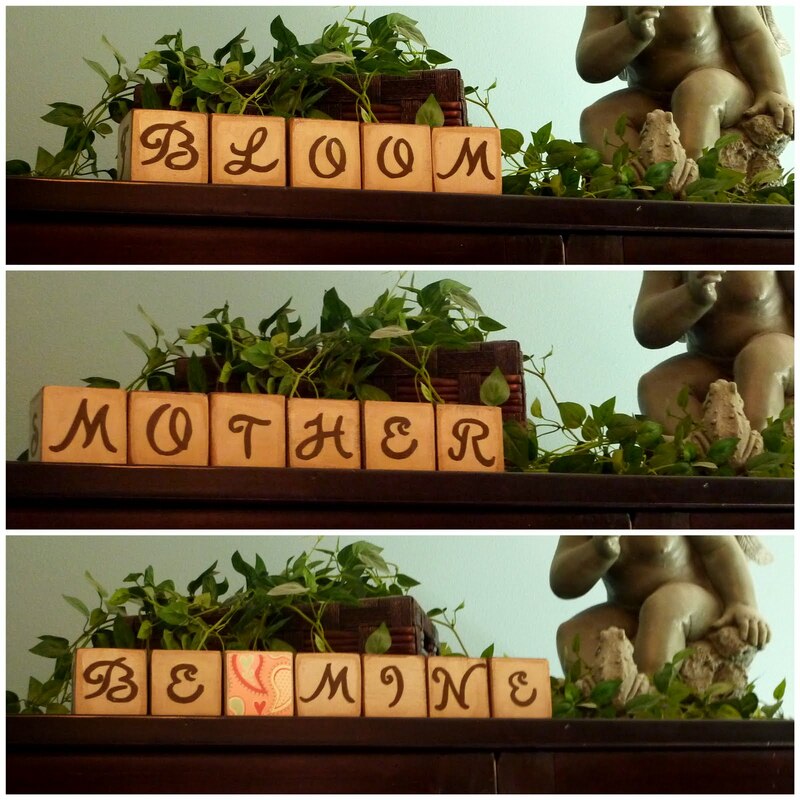 As I mentioned before I decided to make four sets as mother's day gifts. My hubby wondered why we couldn't just get them some bath products but I insisted this would be "SO MUCH FUN!" Boy did I bite off more than I could chew. If you do the math, I made 52 blocks and cut out 240 letter by hand! I wasn't able to get them ready for Mother's Day but I'm sure they will love them and be well worth the wait. and the grey set is for me! Sorry about the blurry pictures, photography isn't my strong point. Mann Land 5 is hosting a "Rate Your Space- Nurseries/Kids Rooms" contest so I entered both my kiddos rooms. I will love you forever and ever if you hop on over and give me your vote. (rooms 6 & 7 if you didn't already know) Or you could hop on over and vote for anyone you like, just GO VOTE! Click HERE. First off, this is by no means an original idea. However I still thought I'd show you my spin on it. I also thought it would be fun to have a few extra blocks with decorative images that you could accent with. Of course all four sets are different to fit each person. I hand painted on the letters but I'm not thrilled with how they turned out. So I'm thinking I'm going to try something different. But I thought I'd share what I've got so far. 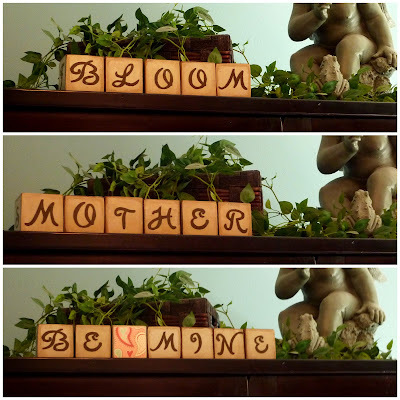 Once I get it just right I will post a full tutorial included all the possible words you can make with a set of these blocks. So to all the Mothers in my life, THANK YOU for being such inspirational women. Through your examples I know that I can continue to grow as a women and mother. I appreciate all that you do for me and my kids and love you all more than words can express. So here is your Mother's Day gift although it probably won't be in your possession for another couple of weeks. For today's scrumptious Sunday I'm going to share a meal that my family really enjoys. It is a Kraft recipe that my mother-in-law found in a "food and family" magazine. Its way yummy, the kids love it (so does my husband) and best of all SUPER QUICK AND EASY!!!! BROWN meat in large nonstick skillet on medium-high heat; drain, if necessary. 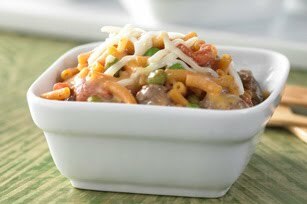 STIR in Macaroni, Cheese Sauce Mix, tomatoes, peas and milk. Bring to boil; cover. Simmer on medium-low heat 12 min. or until macaroni is tender, stirring occasionally. TOP with mozzarella. Remove from heat. Let stand, covered, 5 min. or until mozzarella is melted. Next time you need a quick, yummy, kid friendly meal you'll know just what to do! I will say this much, so far I am thrilled with how they are turning out! So this is supposed to be an "interior design" blog but Remodelaholic is hosting a recipe link party so I thought I'd share one of my favorite recipes. (Everyone likes a little crossover anyway right?!?!) In fact, I have several great recipes that are definitely share worthy. So I've decided, from this day forth, I will hold what I'm going to call "Scrumptious Sunday" and share a new and delicious recipe every Sunday. * If you also read my family blog, this first recipe will be a repeat. I consider myself a fairly decent cook. I have been pretty proud of some of the things that have come out of my kitchen, but when I made Chicken Tortilla Soup and my husband declared it "the best tortilla soup ever and possibly the best thing I have EVER made," I knew it was too good not to share. And the best part? It is SUPER easy! The recipe originally came from allrecipes.com but I've changed it up a bit to get it perfect. *note: seasoning measurements are approximate. I just eyeballed everything so be sure you season to taste. Place all ingredients in a large slow cooker. Cook on low for 6-8 hours or on high for 3-4 hours. I just put the chicken in frozen and then removed it about an hour before I was going to serve and shredded it. Garnish with tortilla chips, cheese, sour cream and/or avocado slices. Serves 8 but make the whole batch as the leftovers are killer! I had a hard time deciding what to post as my favorite room in today's parade of homes link party. We probably spend the most time in our living room, but its in need of a revamp. (At least in my eyes.) I like how my basement is shaping out but nothing down there is quite "done." So in the end I decided to link the past post of Ava's room. So if you are new to this blog be sure to head on over and check it out! Even though I wanted to show off something new, I felt like her room really is the shining jewel of our home. (How unfair is that?) But not to worry, this has motivated me to get downstairs and finish some stuff up. Hopefully I'll have something new to show you in the near future.